We kindly request a credit card to reserve appointments. You may call within 24 hours to cancel in order to avoid any charges. Bridal parties and special events are required to put a 50% non refundable deposit on services reserved at the time of booking and can be cancelled up to two weeks prior to appointments to avoid any additional charges. All prices are subject to change and may vary according to technician’s level of training and experience. Clients should arrive at least 15 minutes prior to your appointment so you may have time to relax and get changed. For a relaxing experience for you and other guests, we ask to leave cell phones off, or on in manner mode. For the safety of your children and the Salon’s, we suggest that children be seated and supervised at all times. It is at the Salon’s discretion to deny any requested services to a client or postpone their service for any contagious ailments. 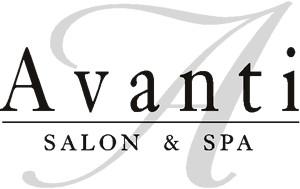 Avanti offers complete care for the body and mind. Treat yourself or your special someone to rejuvenating treatments such as Body Massages, Body Scrubs, Facials, Manicures and Pedicures, all designed to pamper your skin while offering total relaxation. We offer Haircuts, Highlights, Bridal Hair & Makeup as well as Waxing for Women and Men, Vichy Shower, Nail Enhancements, Ear candling, Make-Up Artistry, Hair stylists & salon specials and more.